Texas A&M student assistant, Mike Richardson, shoves West Virginia’s cornerback, Daryl Worley, during the AutoZone Liberty Bowl. *This article was originally published on The Sports Fan Journal. While former Texas A&M quarterback Johnny Manziel is vowing to not be a jackass anymore, the Aggies have already found their replacement in student assistant Mike Richardson. Defense has clearly been a problem for A&M this year, so Richardson, a former linebacker from the 2012 signing class, took matters into his own hands. 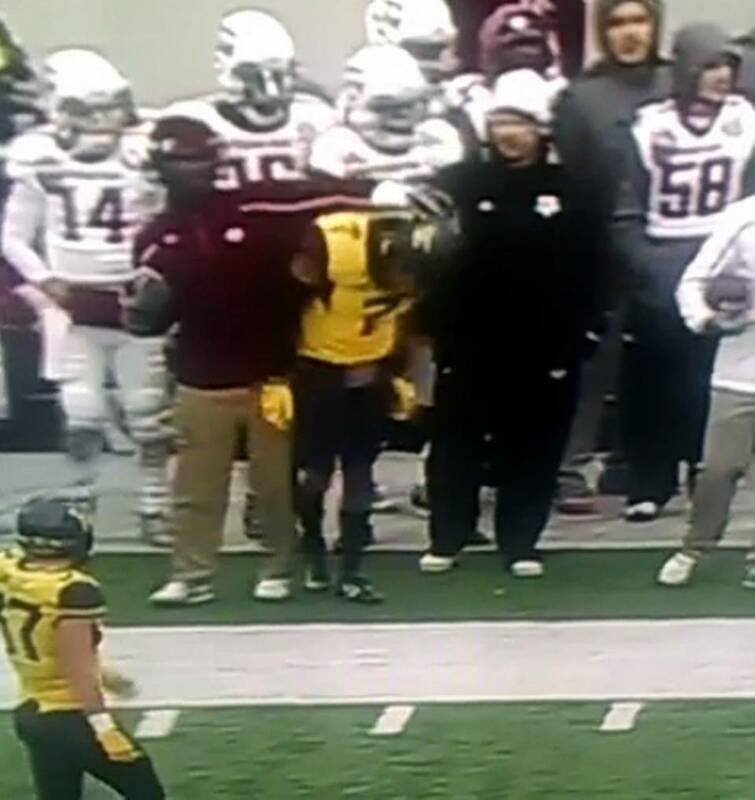 On two separate occasions in the second quarter, Richardson was seen shoving and throwing punches at Andrew Buie and Daryl Worley of the West Virginia Mountaineers. Richardson played as a true freshman in 2012 before suffering a broken neck in a Nov. 12 win over Sam Houston State. After having career-ending surgery, Richardson has served as a student assistant ever since. His time with that position may be coming to an end. After being informed of the situation, head coach Kevin Sumlin made Richardson stay in the locker room for the second half. The Aggies went on to win the AutoZone Liberty Bowl over West Virginia 45-37, but thanks to Vine, two blows by Richardson will be remembered more than Kyle Allen’s impressive performance. The jackasses live on in Aggie-land. Oh, and maybe a particular Mountaineer player will get the chance to see Richardson outside the stadium. to the A&M coach, assistant, trainer whatever you wanna call yaself that punched me in the head.. just know ima see you again in life!